Proudly Western Australian owned and operated since 1973, Westral is a leading manufacturer and retailer of blinds, security doors and screens, patios, awnings and shutters. Westral manufactures its products in its purpose-built Canning Vale factory and wholesales and retails them from showrooms at Canning Vale and Balcatta. Westral prides itself on measuring, manufacturing and installing to the highest possible standards, and aimed to maintain similar standards when it turned to Stott Hoare to improve its IT infrastructure by replacing an existing small virtualised server to provide greater flexibility, and the ability to upgrade hardware and software faster. A critical consideration was to deliver a fully redundant solution with rock-solid disaster recovery capability for vital business systems used by 60 staff across Westral’s two sites and a further 20 mobile users. Stott Hoare designed and implemented a total end-to-end solution that used IBM servers and storage systems, and VMware virtualisation, recovery and backup software. Data is replicated across both sites to help plan, manage and automate failovers. “Business continuity protection was critical as this infrastructure is vital to Westral’s operations. The systems had to be fully redundant, with full duplication of data and fully automated disaster recovery planning and recovery processes,” said Cameron Drake, Westral IT System Administrator. “We also preferred deal with one, local supplier who could provide a ‘complete package’ solution and support it into the future,” said Cameron. “Stott Hoare is perfectly placed to provide complete solutions such as Westral required,” said Brian Hawkins, Stott Hoare Sales Manager. “We have over two decades experience installing and supporting network servers and storage systems throughout Australia, and have been at the forefront of the move to virtualisation, particularly with industry-leading VMware virtualisation, site recovery and backup software. “As one of WA’s largest and longest-standing IBM Premier Business Partners, we also supply and install the legendary capacity, reliability and durability of IBM, and support it through our service team. Stott Hoare’s solution for Westral began with IBM x3650 servers, three at Canning Vale, and two at Balcatta. The IBM x3650s provide outstanding performance for mission-critical applications in an industry-standard server. Their Intel Xeon 4C processors and IBM Dual Rank Chipkill memory enhance speed, reliability and performance, and reduce power use. They’re also easily scalable and offer comprehensive management tools, advanced diagnostics and the ability to control resources from a single point so they’re easy to deploy, integrate, service and manage. Stott Hoare recommended IBM DS3512 network storage arrays at both Westral sites. The IBM DS3512’s 6Gbits/sec SAS drives deliver the high capacity and low cost of SATA, but with SAS drive electronics for greater reliability. At up to 24TB capacity, these IBM network storage arrays offer easy scalability and a high level of flexibility and resilience. 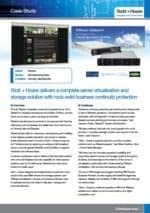 With such solid hardware solutions specified, Stott Hoare chose VMware vSphere 4 virtualisation software. vSphere 4 accommodates almost every aspect of managing a virtual infrastructure, from ESX host provisioning to virtual network management, to backup and recovery of virtual machines. Stott Hoare Solution Architects have extensive experience in VMware, and are fully trained and accredited in its virtualisation and data and site recovery software. VSphere was enhanced with VMware vCenter Site Recovery Manager to provide a disaster recovery management and automation solution. This fulfilled Westral’s objective of making failover and recovery rapid, reliable and manageable and expanded its protection of all its business-critical systems and applications. An even greater level of protection was added with Veeam Backup Enterprise, which provides Westral with 2-in-1 backup and replication for its virtual machines.